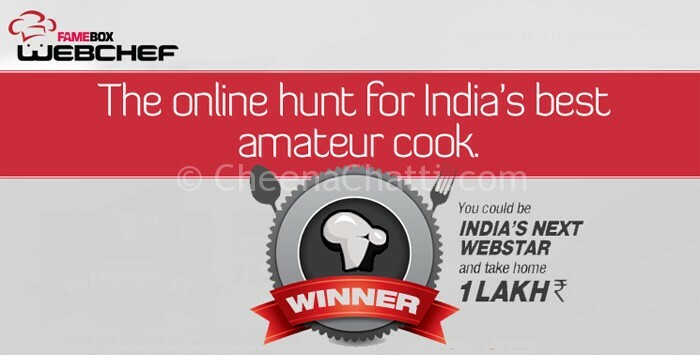 If you haven’t heard about FameBox before, its a multi-channel talent platform for digital media which is running India’s first web-based talent hunt (FameBox Web Chef Contest) for the best amateur chef in the country. We were quite surprised when the FameBox team (in partner with BlogMint) asked us to to judge some videos and select one, which we feel as different and unique and host it on our blog. Following are the videos we received from the Famebox team for reviewing. The videos were judged by our chef Athira. Though all the three chefs Aarthi, Yuvraj and Sneha did a really nice job, we think the presentation by Yuvraj was an outstanding one and need special mention. We would really like you guys also to have a look at these videos and share your comments too. Very brief and precise narration. Good sound clarity and very good presentation. The things what she did is with full of confidence. He didn’t explain what are the ingredients needed for the cake. Yuvraj has followed a traditional method, and it is as perfect as it looks. I couldn’t find any flaws or any imperfections in the video. Very good sound clarity, wonderful kitchen and very confident presentation. Cutting the cake using the dental floss was new to me. I have never tried that. So going to try that in my next cake. The very first thing is the low sound clarity/blurred voice/uncompleted sentence. She explained the ingredients, but not the measurements. 2 cups maida she mentioned, but not the number of eggs to be used, it would be confusing. The next is, as per my knowledge we should mix all the wet ingredients together before adding the dry ingredients to the batter. She has alternatively beat maida and oil, which i would not recommend. Preferably glass bowl and wooden spoons/silicon spatula could be used for cake mixing. She did not mention the temperature in which the cake to be baked and the baking time too. Irrespective of the above -ves, the outcome she showed is too good. She didn’t cut the dome of the cake to be iced. Normally we do cut it off, to get a perfect look. But she has managed to do it good. This entry was written on January 16th, 2014 by Athira Sooraj. Posted in Reviews and was last revised on April 5th, 2018. How to prepare and serve onasadya dishes?